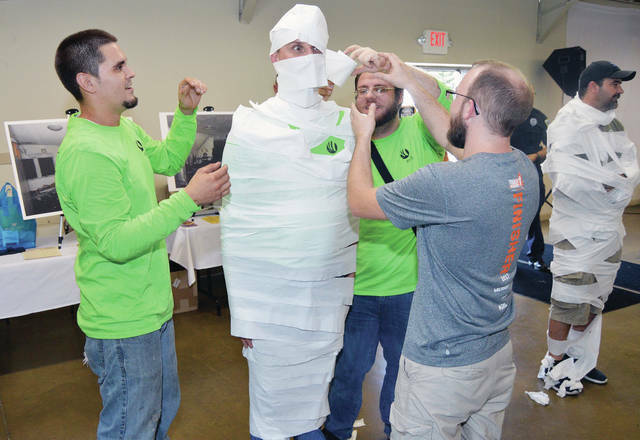 Hydro Logistics Supervisor Dave Ratcliff, of Troy, is wrapped in toilet paper by, left to right, Michael Jennings, of Piqua, and Brian Gold and Travis Lewis, both of Sidney, during Hydro Safety Day at the Shelby County Fairgrounds, Wednesday, Aug. 29. SIDNEY — Workers at Hydro Sidney joined fellow employees in 38 plants around the world, Wednesday, Aug. 29, in a company-wide shutdown to learn about and celebrate safety. 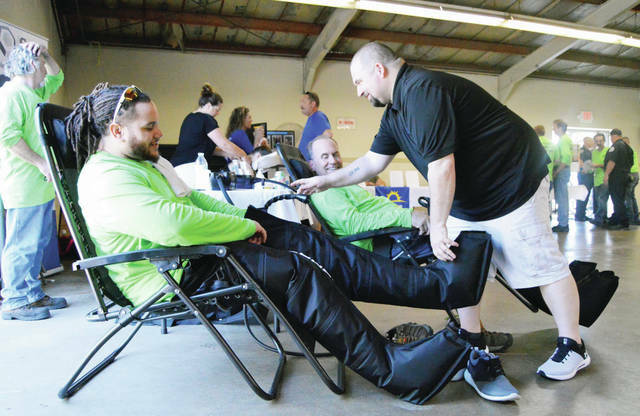 The fourth annual Hydro Safety Day was observed by local staff at the Shelby County Fairgrounds as all 258 employees from three shifts got a half-day away from the plant. Visitors from Hydro’s corporate office in Chicago were also on hand. The company fabricates and extrudes aluminum. The event began with a video featuring the president of Hydro and speakers from various plants, who talked about safety and why it’s important to them. “We want everyone to know that safety is everybody’s responsibility, and we want everyone to go home to their families each day the same way they came to work,” said Sidney Plant Manager Ann Mueller, of Celina. In fact, the plant was celebrating 802 accident-free days. In honor of the achievement, employees were treated to a steak dinner. By visiting the information tables of 15 vendors, they could have their names entered into drawings for prizes ranging from grills and bicycles to car safety kits and first aid kits. The vendors were the Shelby County Counseling Center, Ron & Nita’s, the Sidney Police Department, Freedom Chiropractic, Sidney-Shelby County YMCA, Upper Valley Hearing and Balance Inc., Wilson Health, Sidney Emergency Services, the Cryo Effect, Amanda North Licensed Massage, Premier Plastic Surgery and Dermatology, Stauffer Gloves and Safety and Vein Care Center. “The vendors show us new products, things we can do to stay safe,” said Dave Napier, of Sidney, a third-shift coordinator. Saw operator Zeke Luna, of Troy, agreed. “It’s a good opportunity to learn about our vendors. Places like Ron & Nita’s. They’re so awesome. They’re genuinely nice people. That’s hard to come by these days,” he said, as he waited for his turn in the Normatech Compression chairs. For her part, Nita McCrum, owner of Ron & Nita’s, said, “It’s nice to get comments like that.” This was her first Hydro Safety Day, although she has promoted her store at those of other companies. She was impressed that all the Hydro employees were there at the same time. “Usually, (employees at other companies) just (participate) on their breaks,” she said. Pam Trent, a social worker representing the Shelby County Counseling Center, was at her first Safety Day. “People are interested in reading our information,” she said. Corn hole and janga games went on throughout the day. Bingo attracted lots of players. Teams from various Hydro departments raced each other to “mummify” their supervisors in toilet paper. The winners were machine operators Jaime Hughes and Keith Dotson, both of Sidney, and Camielle Spradlin, of Piqua, who wrapped up Production Supervisor Cory Heffelfinger, of Sidney. Workers enjoyed the activities, but more of them appreciated the chance to spend time with each other away from the shop floor. “Seeing them outside the workplace, they’re totally different from inside the workplace,” said saw operator Roger Case, of Sidney. “There are people on other shifts we don’t see,” said Shoda operator Kiley Swiger, of Sidney. “We like to mingle.” Painter Abou Ndiaye, of Sidney, who has been a Hydro employee for just three weeks, echoed the sentiment. “I think it’s an amazing thing to come together to learn new things and come together to enjoy the day. I like how they have prizes you can win. That’s pretty cool,” he said. Third-shift coordinator Doreen Thompson, of Sidney, has attended all four of Hydro’s Safety Days during her seven and a half years of employment there. “This year, there are more games, more prizes,” she said. The firm’s Safety Committee coordinated the event. Committee members are Mueller, Brown, Brittney Smith, Juanita Barham and Jennifer Kinninger.